There are many ways to support sustainability and get healthy nutritious food in return. 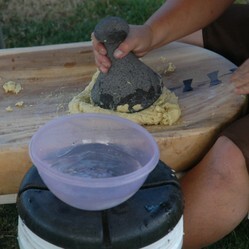 The Grown Hawaiian Festival showed how traditional and modern ways work together. A couple of weeks ago, the “Grow Hawaiian Festival” took place; a free event dedicated to clean energy and sustainability. The name says it all, it was one big show room of how locally grown produce, traditional local arts and crafts, and modern solutions for clean energy and energy conservation all play an important role. The most apparent example is probably the utilization of local food resources, so here I would like to focus on this aspect. Besides the increasing popularity of farmers’ markets, which offer a great variety of fresh produce, there are a handful of festivals which celebrate local food or even one particular fruit (like Kava Festival, ‘Ulu Festival, Taro Festival). Those fruits are referred to as canoe plants, as the early settelers brought them with them in their canoes on their voyage to Hawaii hundreds of years ago. A great website describes all those plants and their use. One of my favorite is the ‘ulu or breadfruit, which can be processed at its various stages of ripeness and can be used like, e.g., potato or sweet potato (‘uala). Another delicious dish with a lot of work behind it is the ‘ulu poi. With a poi pounder, carved out of lava rock, the baked breadfruit is mashed into poi (the famous cousin is the kalo poi or mashed taro root), a delicious and nutritious dish. Sample of a Bread Fruit? A local practice, though not considered a Hawaiian tradition, is the hunting of invasive species like goats, sheep, but mostly boar. Like with many species once introduced to the Islands, their population got out of control and there is an ongoing dispute between local hunting groups and the government of how to reduce their number. I can’t and don’t want to judge any of the methods, but if hunting is done to provide food for the family, and here it usually is, it seems like a valuable contribution to sustainability. Speaking of meat, Parker Ranch on Big Island is one of the biggest ranches in the US; still almost all beef consumed in Hawaii is being shipped from the mainland. One reason I read, it is much cheaper to ship their calves to further processing to the mainland than having food (grain) being shipped to Hawaii. Only a small percentage of natural, grass fed, locally raised beef is available on some farmer’s markets and certain restaurants. Another representative of a different food group worth mentioning is the Maui Surfing Goat Dairy near Kula. They provide a large variety of goat cheese and other products and meet the Humane Farm Animal Care Product standards. They also offer great tours of their farm for the whole family (where kids can feed the goats). The Hawaii Island Goat Dairy is located on the Hamakua Coast of the Big Island and their feta is served in many resorts and restaurant on the Kona side. Otherwise, the last big local cow dairy farm closed a couple of years ago; leaving only two small businesses in the entire state. Last year however, a business consortium has been formed to find land to develop grass fed dairy farms and re-introduce locally produced dairies to Hawaii. So one needs to look out for products from the ‘Tropical Dairy Solutions, LLC’ and hopefully they will come up with suitable places that deliver healthy products. Considering the rather limited space on the Hawaiian Islands, it would not be possible to substitute all the imported produce needed for the population, including the many visitors. Still, supporting the local businesses and the willingness to pay a little bit more for better quality helps to boost the regional economy and increases sustainability. A festival is a great outreach to the public. Very hands on, traditional and modern ways of sustainable living were shown right next to each other at the "Grow Hawaii Festival".